UPDATE: Jesse tells us, “I would gladly go through all I have been through again, if in the end I could have Katherine.” is officially engaged to his tattooed girlfriend Kat Von D … seven months after his divorce from Sandra Bullock became final. Last night, Kat was sporting a GIANT ring on her wedding finger during an event at an art gallery in L.A. … the same ring she’s been sporting since September. But when we asked if the jewelry was an “engagement ring” … Kat’s lips were sealed. 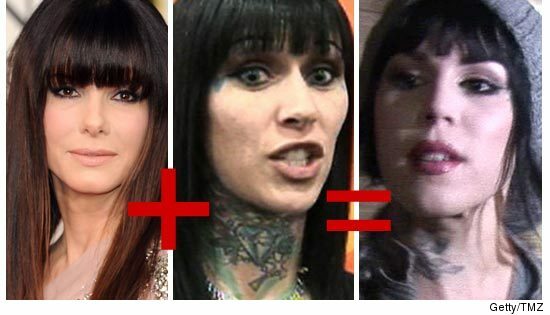 With his engagement to Kat Von D, Jesse James may have finally found the formula to a happy marriage. How’s this for irony … getting sued over a court appearance … which is exactly what’s happening to Jesse James‘ ex-wife, Janine Lindemulder. We’ve learned the photog who went down hard during Janine’s court appearance in October is filing suit against her, claiming she committed a battery against him and he suffered injury as a result. Kat Von D put up one hell of a fight — but TMZ has learned producers behind “L.A. Ink” have decided to include footage of Jesse James in the season finale, despite Kat’s demand to cut him from the show. Sources connected to the TLC reality show tell us … “Ink” execs felt they would be “sacrificing the integrity of the show” by ignoring Kat’s headline-making relationship and break-up from James in tonight’s season finale. As we previously reported, Kat flipped out a few weeks ago when she saw a preview of the finale — which featured the relationship — and demanded producers either pull the footage, or she would refuse to participate in future production. Kat lost that battle — but she did score ONE victory … we’re told producers did agree to cut some controversial footage showing Kat bad-mouthing another one of her exes, Nikki Sixx.